1. 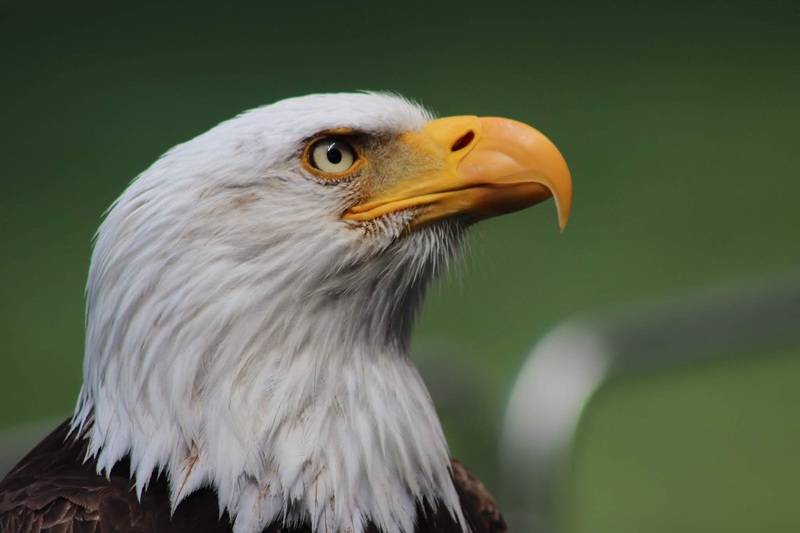 Eagles Have Vision: If you ever happen to see an eagle sitting high above the tree or cliff of a stiff mountain, watch closely and see how attentive the bird is. The body sits still and the head will be tilted side to side to observe what is happening below, around and above it. Even if its flying close by, you can observe how keen its eyes are looking for its prey. Eagles have a keen vision. Their eyes are specially designed for long distance focus and clarity. They can spot another eagle soaring from 50 miles away. Take Abraham Lincoln for example. Abraham Lincoln, the 16th president of the United States, guided his country through the most devastating experience in its national history, the Civil War. He had a vision, to save the union and free the slaves. He is considered by many historians to have been the greatest American president. You must have a vision that guides and leads your team towards the organizations or societal goals. The vision must be big and focused. A big, focused vision will produce big results. 2. Eagles are fearless: An eagle will never surrender to the size or strength of its prey. It will always give the fight to win its prey or regain its territory. Try and watch the video on how the Golden Eagle displays remarkable hunting strategy, preying on goats much larger than itself by throwing them off the cliff face. No matter what the size of that person or what weapon they may be holding, you would attack them without thought or regard for yourself. It wouldn’t even dawn on you to be afraid because your instinct is to protect that which you love and cherish. Successful leaders are fearless. They face problems head-on. 3. Eagles are Tenacious: Watch an eagle when a storm comes. When other birds fly away from the storm with fear, an eagle spreads its mighty wings and uses the current to soar to greater heights. The eagle takes advantage of the very storm that lesser birds fear and head for cover. Challenges in the life of a leader are many. These are the storm we must face as leaders to rise to greater heights. Like an eagle, a leader can only rise to greater heights if he takes up the challenges head on without running away from it. This is yet another leadership characteristic. 4. Eagles are High Flyers: ￼￼￼Eagles can fly up to an altitude of 10,000 feet, but they are able to swiftly land on the ground. At 10, 000 feet, you will never find another bird. If you find another bird, it has to be an eagle. An eagle doesn't mingle around with the pigeons. It was Dr Myles Munroe who said that. Pigeons scavenge on the ground and grumble and complain all day long. Eagles are not. They fly and make less noise waiting for opportunities to strike their next prey or glide with the current of the storm. Great leaders are problem solvers. They don't complain like the pigeons do. They love to take challenges as the eagle does when the storm comes. 5. Eagles Never Eat Dead Meat: An eagle never eats dead meat. In other words, an eagle does not scavenge. It only eats the meat from the prey it kills itself. Eagles eat raw and fresh meat What a great act of true leadership. A true leader spends time with people who are vibrant and liberal in thinking. You have to be with people who can think, make informed decisions and take actions. These are the people who bring changes to society. They are lively and active people. Go out and look for them. According to Tony Buzan, a proponent of the techniques of Mind Mapping and mental literacy, these type of people are called change thinkers and change makers. There is a saying that goes like this: "People you hang around with and the books you read eventually determines the person you become." 6. Eagles posses Vitality: Eagles are full of life and are visionary but they find time to look back at their life and re-energize themselves. This happens at about the age of 30. What happens is that when the Eagles reach the age of 30, their physical body condition deteriorates fast making it difficult for them to survive. What is really interesting is that the eagle never gives up living, instead it retreats to a mountaintop and over a five-month period goes through a metamorphosis. It knocks off its own beak by banging it against a rock, plucks out its talons and then feathers. Each stage produces a re-growth of the removed body parts, allowing the eagle to live for another 30 - 40 years. There are times in your life as a leader that you must look back and take stock of your life. The good and the bad experiences you have been through as a leader. Are you keeping in trend with the current knowledge trend? Do you need to improve your certain areas in your life as a leader? Great leaders are the ones that always do "check and balance" of their personal and professional lives and make an effort to learn things every day. 7. Eagles Nurture their younger ones￼￼: Believe this or not. Eagles are known for their aggression. They are absolutely ferocious aren't they? Anyone who doesn't have total knowledge of this great bird will say yes. What is more astonishing with this bird is their ability to nurture their young ones. Research has shown that no member of the bird family is more gentle and attentive to its young ones than the eagles. This is how it happens. When the mother eagle sees that time has come for it to teach the eaglets to fly, she gathers an eaglet onto her back, and spreading her wings, flies high. Suddenly she swoops out from under the eaglet and allows it to fall. As it falls, it gradually learns what its wings are for until the mother catches it once again. The process is repeated. If the young is slow to learn or cowardly, she returns it to the nest and begins to tear it apart, until there is nothing left for the eaglet to cling to. Then she nudges him off the cliff. True leaders are not bosses. They grow with their people. They strive to make individuals in the organization or society grow to their full ability. They teach and guide just like the mother eagle does. They never stop giving challenges but never-give-up empowering and directing. Note: If you learnt something from this article, let me know by commenting in the comments section below.